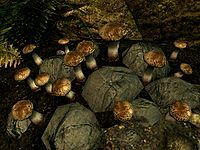 A brown capped mushroom found across Tamriel. 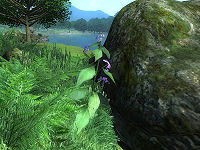 A poisonous plant found in many places across Tamriel, with bright purple flowers. It is common to the West Weald region of Cyrodiil and many of Skyrim's holds, as well as parts of Elsweyr. A very rare plant that grows near water. It gives off a low hum when nearby and has amazing magical potential. Originally yellow-leaved, the plant mutated drastically during the Sun's Death event of 1E 668. Due to its magical nature, it sensed as a species its impending extinction and used the ash salts found falling from the sky as a new source of food. This allowed the plant to live without sunlight. 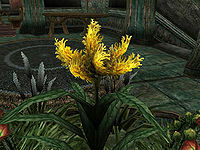 As the ash content of Cyrodiil's soils diminished, so too did the plant's numbers and it is once again on the brink of extinction. Crimson Nirnroot is a rare type of nirnroot unique to Blackreach, a massive cavern beneath Skyrim. 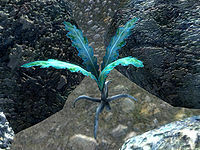 Nirthfly is a domestic plant found in Mournhold. The flower bearing stalks are gathered by alchemists. 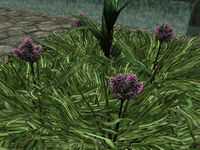 Noble Sedge is a small plant with purple flowers found in the city of Mournhold. Esta página foi modificada pela última vez à(s) 15h53min de 13 de julho de 2014.